Do you ever feel overwhelmed when you look at your pipeline and think about what you need to do to fill it? I think it's the curse of business owners and executives these days. You look at how many new clients you need to bring in to hit your targets and then you try to think about how you're going to do it. But it's so difficult to know where to start. What will actually work? Back in the day, you pretty much had the choice of networking, direct mail, telemarketing or advertising when it came to marketing. Each with their own established best practices and rules. Today we've got organic and paid search, social media, social media ads, video marketing, email marketing. And it all seems to be changing all the time. I've lost count of the number of “next big thing” emails I've had trying to convince me to buy the latest and greatest method for getting a so-called flood of clients with some newfangled technique. When you're just starting out – or even if you're fairly well established – it can all be so overwhelming. So difficult to know what to do. It was a big issue for me when I set out on my own. In some ways because I focus on marketing and sales it's worse – because I deliberately keep tabs on all the newest approaches. Every time I tried to think of what I should do I couldn't get a clear picture in my mind. And all the stories of other people succeeding with this method or that method just confused me further. So how on earth do we figure out what to do without spending every waking hour networking, phoning, tweeting or blogging? Well, what follows is an approach I evolved that worked for me to clear the fog of uncertainty and give me some clarity on what to do. I can't promise it will work for you – but give it a try – it's been helpful to a number of people I've shown it to. The key to is to break down your marketing into manageable chunks. Ones you can think about sensibly. Too often, when we think about how we're going to get new clients we lump all our potential clients into one amorphous blob. And you know what? You can't market to an amorphous blob. So I found it helpful to split my clients into Top Clients and Others. For me, Top Clients are the top 10 clients I'd really love to win over the next 6 months. Clients who – if I got to do business with just one or two of them – could set me up for the year. For you it might be a top 5 or a top 20. But essentially it's a small number of ideal clients you can think about individually. You could go more sophisticated and split into A/B/C or suchlike. But let's keep things simple for now. The “others” are clients I'm not going identify specifically or do a specific plan for – too many of them. But I do aim to win a number of them via more general marketing. Then I split my marketing into short term and long term. Long term marketing is all about building “gravity”. Doing the things that will attract clients to you so you don't have to actively seek them out. Thought leadership, stuff with your website and the like. But long term marketing takes time before it pays off. 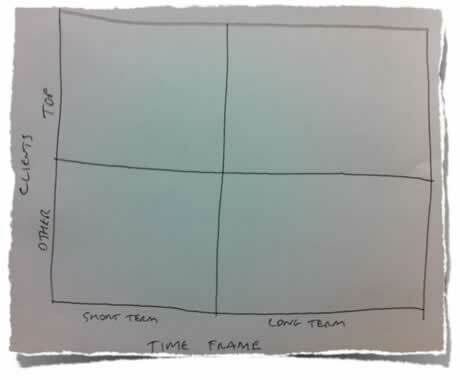 So you also need some short term activities to try to bring in clients right now. The kind of stuff that pays the bills while you work on the long term side. 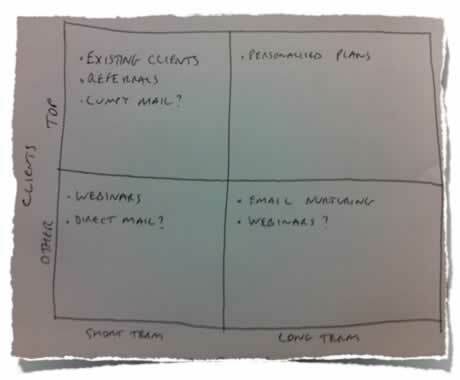 Then I think through what marketing activities would be the most appropriate in each box for each client type/time frame combination. Splitting it up like this makes it much easier. Instead of struggling to see what marketing will magically work for all clients in all circumstances, I can take a “horses for courses” approach. It's much easier to see what marketing will work in the short term for my top 10 clients, or to nurture relationships with the thousands of “other” prospects who visit my website for example. Usually, I end up thinking about referrals and extending existing client relationships for my top clients in the short term. And I develop unique, personalised nurture plans to build my relationship with my top prospects in the long term. Of course, your matrix will look different depending on your analysis of what marketing approaches will work for your specific clients – and what you're good at. But the key is that by breaking it up into this matrix rather than trying to eat the elephant all in one go, you zap the overwhelm. As I say, I can't promise it'll work for you – but it's worked for me and many others – I suggest you give it a go.